91% of S&P 500 companies have reported earnings for the 4th quarter of 2013 so we now have a pretty good sense of how companies performed for the full year. 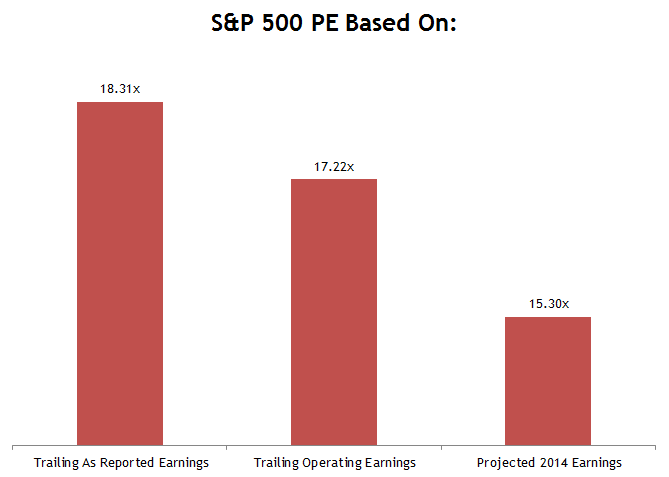 Last year S&P 500 companies reported earnings per share of $100.78 in aggregate. “Operating” earnings, which are earnings that are adjusted for unusual items were $107.13. The current level of the S&P 500 index is 1845, which means that the index is trading for 18.3x trailing “reported” earnings and 17.2x trailing “operating” earnings. These are both relatively high numbers on an absolute basis. The equivalent earnings yields are 5.5% and 5.8% respectively. That’s below the hurdle rate of return that I’d ordinarily expect of 8-10% on equities. Many bulls argue that stocks are still cheap though because the forward multiple of the S&P 500 is much lower than the trailing numbers. The forward multiple, which is based on analyst expectations of what companies are going to earn in 2014 is only 15.3x (a 6.5% earnings yield). The forward number is low because analysts are expecting earnings to grow by 12.5% to $120.60 in 2014. This is a lofty number, especially considering that revenues are only expected to grow by 3.4% after growing by 0.63% in 2013. I have a hard time justifying why analysts are expecting growth to accelerate in 2014, but judging by the difference in trailing vs. forward multiple, I’d say that stocks are counting on the growth to materialize. If earnings growth settles at a lower rate than analysts currently expect, stocks will look pretty expensive by year end. And, at these prices, even if we do see some strong growth in the spring, it’s possible that the growth is already baked into prices. In other words, stocks may not rise even on strong data.